I think my 365 Project is doing a better job of representing how I spend my days this year than it has in previous years. Maybe it’s because I’m not focusing on a particular theme this time around, and just shooting what I’m doing. I realized this when I sat down to process several day’s worth of 365 photos tonight. Why yes! I have spent my week writing a tutorial, crocheting granny squares, enjoying the crocuses, packing orders, and making another polymer granny square cane. How did you know? 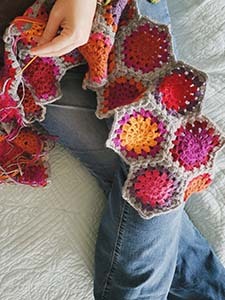 Speaking of granny square canes, I am so happy to see some of you downloading that new tutorial! Have you tried it yet? I made this brown, green, and blue version tonight, and I followed my own advice about splitting apart the corner snakes. Definitely the way to go. On the other hand, I accidentally ignored my own advice when it came to arranging the colors. One of the things I said in the tutorial was that you should try to do it in a particular way, but if you don’t manage, it’s not the end of the world. And it wasn’t. So that’s good news. I also left the black out of the outside rounds of the squares, thinking it might look nice brighter. I think I regret that move, but not enough to scrap it and try again. It’s good enough the way it is. And good thing, too, because I am starting to get a very strong urge to pull out my sewing machine and make some Spring tops. And skirts. And bunting. And and and! But I’ve made a rule for myself this year: one craft out on the dining room table at a time! So, I need to get all of the claywork done before the sewing can begin. It’s going to be hard putting away the polymer while I’m still enjoying it, but it’s probably worth it to keep my dining room from turning back into a crafty tornado zone. As soon as I get the supplies for the last few hooks I have committed to making, it’ll be bye bye clay supplies, hello Simplicity 3835! I do love that colour way. Can I order a crochet hook in it please? 5mm? Sure! I’ve still got the clay out, so why not? 🙂 I’ll email you a link in a moment. Thanks!